High winds from Hurricane Matthew pushed this sailboat aground on the St. Johns River in Florida. Hurricane Matthew left more than 1,000 dead on the tortured island of Haiti, but as the Category 4 storm — the deadliest in the Western Hemisphere since Katrina in 2005 — marched up the Southeast coast of the United States it weakened and stayed just far enough offshore to spare an estimated 2 million people catastrophic damage from winds that early in its 11-day run as a hurricane reached 160 mph. The storm largely went easy on the heavily populated boating centers of South Florida but left a trail of destruction in northern parts of the state — largely concentrated around St. Augustine — as well as in Georgia and along the Carolina coasts. “We’re blessed that Hurricane Matthew stayed off the coast,” Florida Gov. Rick Scott said in Jacksonville after surveying damage. Still, the hurricane took at least 38 lives in the United States — 19 in North Carolina, 12 in Florida, three in South Carolina, three in Georgia and one in Virginia. Goldman Sachs, the securities firm, estimates damage in the United States at $10 billion. Had the storm come ashore in South Florida as a Category 4 or 5 hurricane, as first feared, statewide damage from surge and flooding alone could have approached $189 billion, according to the analytics firm CoreLogic. The storm was well forecast, hewing to a track along the Southeast coast as a ridge of high pressure in the western Atlantic guided it northward. Meteorologists credited a slight eastward jog in Matthew’s track during an eyewall change over the Bahamas with setting it on a course that barely brushed South Florida and kept the eyewall 20 to 50 miles offshore as it trekked north. Matthew finally made landfall Oct. 9 at McClellanville, S.C., as a 75-mph Category 1 hurricane, its power having been sapped by 30- to 40-knot wind shear, dry air and cooler ocean temperatures north of Florida. Along the way to landfall, its sustained winds landside along the U.S. coast seldom exceeded hurricane strength (74 mph), but its gusts took it well into hurricane territory: Cape Canaveral, Fla., 107 mph; Tybee Island, Ga., 96; Daytona Beach, Fla., 91; Hilton Head, S.C., 88; and Jacksonville, 87. Two boats can be seen in foliage near St. Augustine, most likely deposited there from Hurricane Matthew. As predicted, Matthew’s storm surge and inland flooding proved a greater danger to the U.S. than its winds. As the storm grazed the east coast of Florida as a Category 3 hurricane, its tropical-storm winds extended 185 miles from its center, piling up water against the curving coastline running from north Florida to South Carolina. Florida, Georgia and South Carolina reported record and near-record tides, and extensive beach erosion and coastal damage as the surge rushed in on high tides. Tide gauges reported peak storm surges of 7.8 feet in Fort Pulaski, Ga.; 6.4 in Fernandina Beach, Fla.; 6.1 in Charleston, S.C.; 4.5 in Mayport, Fla.; and 4.1 in Wilmington, N.C. Historic St. Augustine’s downtown was inundated with several feet of water, which poured in over the seawall running next to the 17th century Castillo de San Marcos. As a weakening Category 1, Matthew approached the south coast of North Carolina, combining with record levels of atmospheric moisture to dump record rainfall in the Carolinas, Georgia and as far north as Virginia, spawning widespread flooding. Savannah’s Hunter Army Airfield reported 17.36 inches of rain; Beaufort, S.C., 13.99; William O. Huske Lock and Dam 3 on North Carolina’s Cape Fear River, 15.65; Fayetteville, N.C., 14.87; Goldsboro, N.C., 15.60; and Chesapeake, Va., 12.84. The Lumber River in North Carolina burst its banks, flooding the town of Lumberton and requiring the rescue of more than 1,000 stranded townspeople. The Neuse and Tar rivers crested at record levels and flooded, also driving people from their homes. Matthew formed from a tropical wave that rolled off the African coast in late September, and on Sept. 25 it received the designation Invest 97L southwest of the Cape Verde Islands. Three days later near the Windward Islands, the system had organized sufficiently to be given the name Tropical Storm Matthew. On Sept. 29, as Matthew continued its westward advance into the eastern Caribbean, it became a hurricane and quickly intensified, reaching a Category 5 strength of 160 mph on Oct. 1. Turning north, it made its first landfall in southwestern Haiti and eastern Cuba on Oct. 4 as a Category 4 storm with winds of 155 mph. It went on to pound the northwest Bahamas — the tourist meccas of Providence and Grand Bahama — on Oct. 6 as a 115 mph Category 3 storm before taking aim at southeastern Florida. The mast of a sunken sailboat juts skyward at the Green Cove Municipal Pier in Florida. Taking a jog slightly eastward, it tracked up the coast of Florida and Georgia, making a second landfall in South Carolina, and as it approached North Carolina it began to move offshore. Forecasters at first thought high pressure building to the north would block the hurricane’s northward progress and send it looping back toward the south and southwest, perhaps returning to the Bahamas as a severely weakened tropical system. That didn’t happen. Instead it continued to track east, and on Oct. 9 the National Hurricane Center reclassified Matthew as a “post-tropical cyclone” with winds still at 75 mph, but those winds continued to diminish as the storm dissipated in the mid-Atlantic. For strengthening 80 mph in 24 hours, third-fastest in the Atlantic behind Wilma in 2005 and Felix in 2007. For maintaining Category 4 or 5 strength for 102 hours, the longest such stretch on record in October in the Atlantic. For its landfall near Myrtle Beach as the first hurricane to strike the U.S. Atlantic coast north of Georgia in October since Hazel in 1954. Total damage was difficult to assess at the time of publication because floodwaters — as well as the death toll — continued to rise in parts of North Carolina that were a good 70 miles west of the coast. Some parts of the state received 15 to 18 inches of rain when Matthew came through on Oct. 8. Flood crests in some areas surpassed the records that followed Hurricane Floyd in 1999, and five days after Matthew had moved out to sea, portions of I-95 — the main thoroughfare from Maine to Florida — were still closed. Some of the worst North Carolina flooding was in Lumberton, a city of about 20,000 some 80 miles from the ocean, after the Lumber River broke its previous crest record by 4 feet. Helicopters continued to pull residents from rooftops and rescue boats ventured down flooded, debris-laden streets to free people who were stranded in swamped homes and cars. Some reports suggested that the waters would not recede below major flood stage in Kinston, N.C., until about Oct. 22. A “major” flood is the most severe on the National Weather Service scale, and it means that mass evacuations are ordered and property damage is extensive. “Our city is just not equipped to handle such mass destruction,” Fayetteville, N.C., resident Tifany Robinson Williams said on Oct. 9. Grady-White Boats in Greenville, N.C., closed after the storm hit, says marketing vice president Shelley Tubaugh. The facility is in an area of Pitt County that was given a mandatory evacuation order as of Oct. 10. The Hinckley yard in Savannah, Ga., was out of commission for nine days after the storm and was scheduled to reopen on Oct. 17. Power was restored on Oct. 12. “The yard was definitely affected,” says Hinckley marketing director Roe O’Brien. “Our office was badly flooded. The only boats that were damaged were the boats that had been tied to the dock, and the docks broke free. O’Brien says general manager Dustin Hartley did “an amazing job” preparing for the storm, and new Hinckley CEO Peter O’Connell and COO Mike Arieta were on site immediately after the storm. It was too soon to determine how much of an impact the flooding and hurricane had on homes and property, let alone boats and marinas, but the transient boat slip website Dockwa began compiling real-time crowdsourced data on the status of marinas in northern Florida, Georgia and the Carolinas. 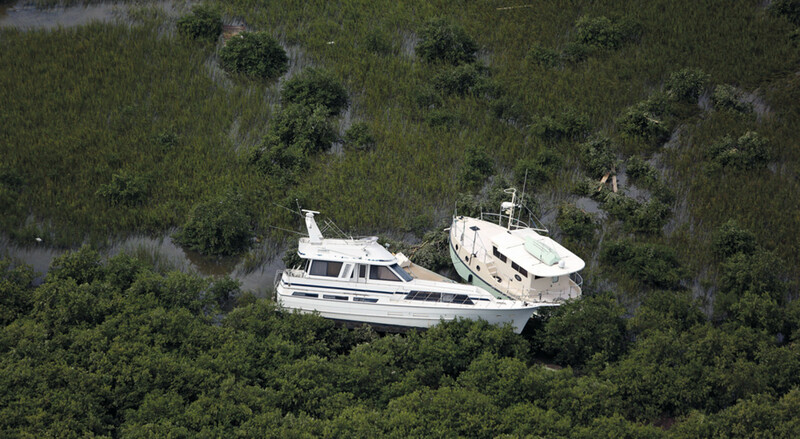 Based on that site’s findings, some of the most widespread damage to boats and marinas was in St. Augustine and Daytona Beach, Fla.; Savannah, Ga.; and Hilton Head, Beaufort and St. Helena Island, S.C. Those areas seemed to have several marinas listed as destroyed or damaged, and many remained closed as of Oct. 13, according to the site. 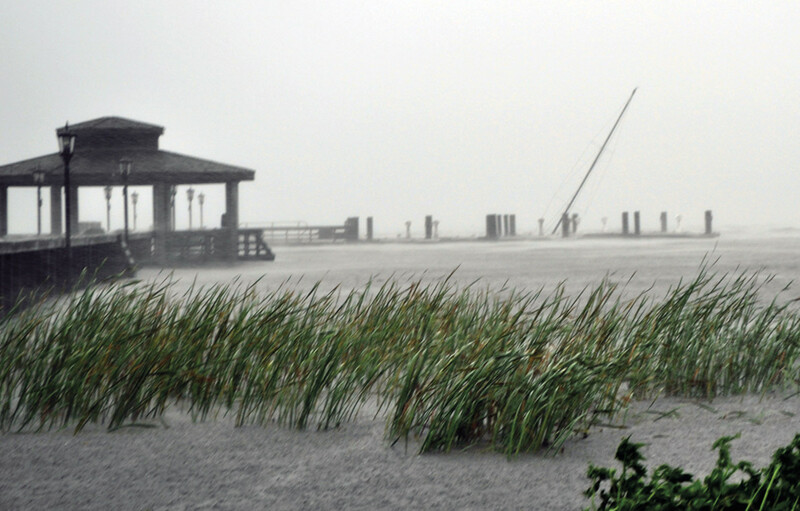 The Southport City Free Dock in North Carolina also was severely damaged. Footage and photos of the Palmetto Bay Marina in Hilton Head, S.C., emerged soon after Matthew departed, showing boats scattered in the wake of the storm. The docks also were heavily damaged, according to CBS affiliate WLTX19. Tracey Owens, owner of the Hilton Head Island restaurant Pure Natural Market next to Palmetto Bay Marina, told the Island Packet in a video that the storm was “absolutely terrifying,” and “sounded like a million chain saws” as it tore into the docks. In St. Augustine, Waylen Bay Marine “thankfully fared pretty well,” manager Eric Conroy said on Oct. 10. “We obviously lost power, and we have one building where part of the roof is missing — one of our new locations” on U.S. 1, closer to the Intracoastal Waterway. “It’s a major investment, and we do work out of there, and when you can’t work, you’re losing money,” Conroy said. Florida Gov. Rick Scott took an aerial tour of Duval County after the storm and surveyed damage to a beach near Jacksonville, according to CNN. Scott said the damage he saw — beach erosion and washed-out roads — was “unbelievable,” but he was relieved that Matthew stayed offshore. During the hurricane, stormwater rushed through streets, making roads look more like rivers in parts of Jacksonville, Merritt Island, Fleming Island and other Florida communities. 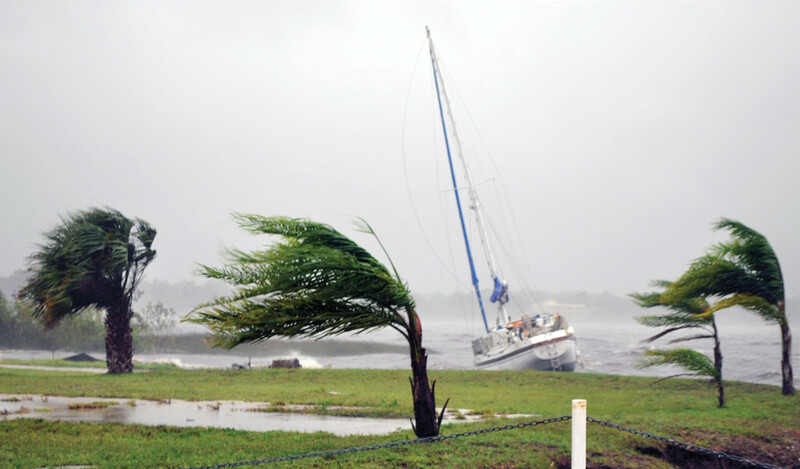 Florida struggled with the rising water, rain and strong winds. Meteorologists said the storm surge was more than 4 feet in some areas. Between St. Augustine and Palm Coast, a small inlet was carved out by the powerful water pounding the coast, stranding four houses on a newly formed island, according to The Weather Channel. The channel is not expected to close because a strong current cuts through it. This article originally appeared in the November 2016 issue.